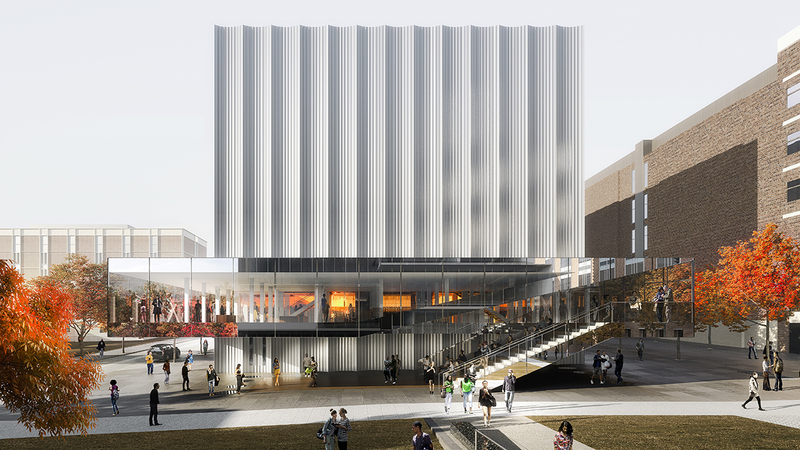 REX has released renderings of Brown University’s new Performing Arts Center (PAC), a 94,500-square-foot boxy building designed with a “radical vision” for the school that features a transformative interior production space. The massive institutional project, located in Providence, Rhode Island, is slated to open in spring of 2022. Joshua Prince-Ramus, principal and founder of REX, said the structure’s design is “extremely precise” in how it fits the needs of Brown students and faculty. His team created the main hall to physically adapt to several different types of performances that the students may put on. “It is not a ‘one-size-fits-all’ auditorium, mediocre to all and excellent for none,” Prince-Ramus said in a statement. “It is literally five very specific, high-performance configurations in one.” What he’s referring to is the venue’s ability to be rearranged into a number of stage and audience setups, from a 625-seat symphony orchestra hall to a 250-seat proscenium theater to a surround-sound cube for experimental media performances. Using both automated and manually assisted performance equipment, the shoebox-shaped hall can change its flexible interior layout and acoustical design to complement the goals of a specific show. The concept echoes the flexible interior of the Wyly Theatre, one of REX's earliest projects. 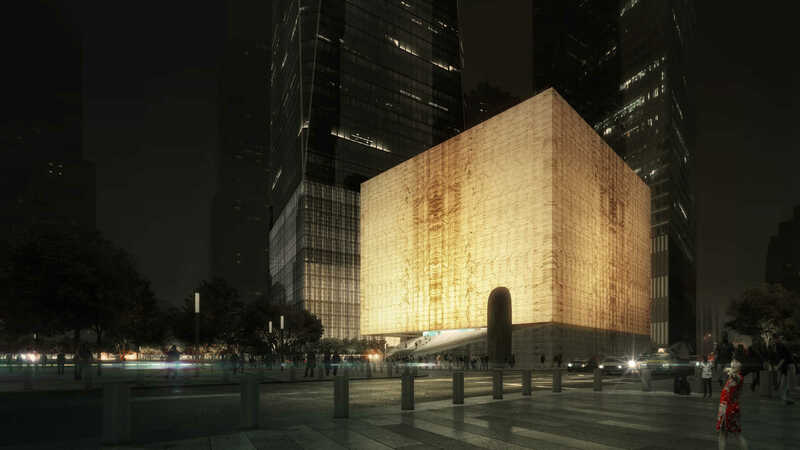 From the outside, the PAC loosely resembles REX’s design for the World Trade Center’s upcoming cultural space, the Ronald O. Perelman Performing Arts Center. Also a looming, solid structure, it commands attention and conceals its insides. Unlike the New York project's translucent marble facade, the Brown building features a seemingly-shrink-wrapped, extruded aluminum rain screen with a fluted shape. The metallic exterior is sure to stand out among the slew of historic buildings on Brown’s urban campus. 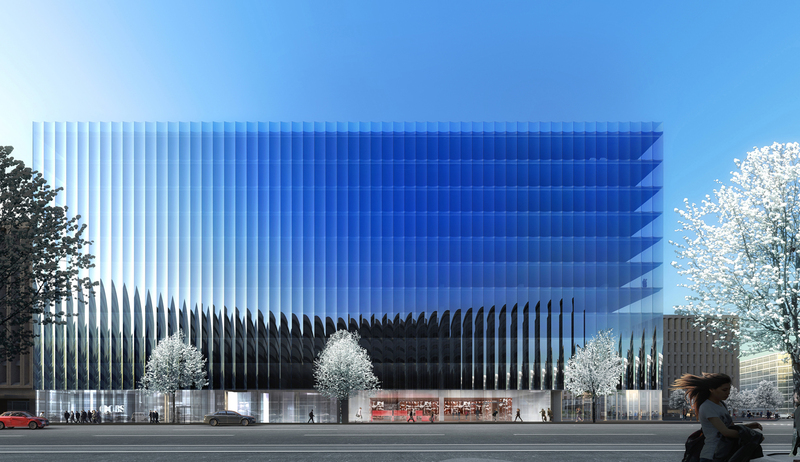 Apart from the cladding, one thing, in particular, is majorly distinctive about the design: The PAC features a 13-foot horizontal “clearstory” window that slices through the building and cantilevers out over the exterior public space. This transparent cutout allows passersby to see directly into the main performance hall as well as the building’s lobby. REX integrated the glazed portion, which opens the structure up to Angell Street, the main thoroughfare in Providence, to spark curiosity and encourage both the public and Brown students to engage with the university’s arts scene. From the inside, visitors can enjoy expansive views of The Walk, a series of green spaces running north to south on campus. The new PAC's suite of modern studios dedicated to dance, music, and theater rehearsals, and intimate performance spaces for smaller gatherings will all be easily accessible from this pedestrian route. The PAC project was birthed out of the Brown Arts Initiative, introduced in 2017 as a way to elevate the university as an incubator for both traditional and experimental art and media. The PAC itself is the physical manifestation of that goal and a new arts typology in architecture, according to REX. With “radical spatial, acoustic, and technical flexibility,” it showcases within the design just how forward-thinking the arts at Brown can be. Last week, the Ronald O. Perelman Center for the Performing Arts, which is currently under construction at the World Trade Center site, was awarded an $89 million grant by the Lower Manhattan Development Corporation (LMDC) and the U.S. Department of Housing and Urban Development (HUD). The long-awaited funding brought the project 82 percent of the way toward meeting its total construction costs. “We are grateful to the LMDC for their support to help realize the dream of creating a performing arts center in Lower Manhattan that will serve the local community, New Yorkers from all five boroughs, New Jersey residents, and visitors from around the nation and the world," said Maggie Boepple, President of the Perelman Center. Designed by New York–based firm REX Architecture, the 90,000-square-foot, 138-foot-tall cube-like structure will hold three open and flexible performance spaces that can fit up to 1,200 people. Its bold exterior, which is clad in marble on all four sides, will stand out from the sea of skyscrapers that surround it. The site will also hold various public meeting spaces and an open plaza. 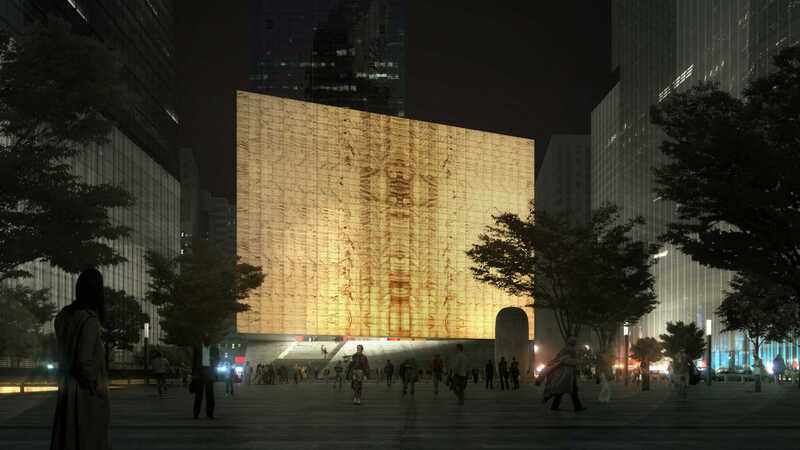 At night, the exterior facade will be illuminated with a warm glow. Since construction commenced in June 2017, the main building’s steel skeleton has risen at a relatively monotonous pace, as the majority of construction has taken place below street level at the soon-to-be Vehicle Security Center. Its main entrance is situated beneath the Financial District’s Liberty Park. As of now, an intricate web of concrete pours and steel beams supports the underground garage floors that compose the lower section of the site. Now that funding has been received, the Performing Arts Center should top out by the end of next year and is scheduled to be fully completed in 2021. 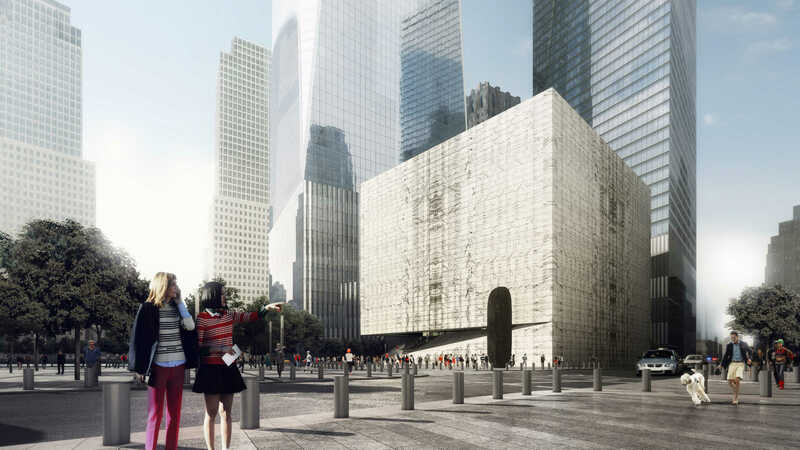 REX's performing arts center at the World Trade Center is finally moving forward. Today Governor Andrew Cuomo announced stakeholders had reached an agreement on developing and managing the 200,000-square-foot multipurpose arts space, which was designed by Brooklyn's REX. Named after financier Ronald Perelman, the Ronald O. Perelman Performing Arts Center will feature three flexible theaters as well as public space—in the form of a restaurant and a gift shop—on the first level. The Port Authority of New York and New Jersey, the bi-state agency that runs the World Trade Center site, will lease space at one dollar per year for 99 years to World Trade Center Performing Arts Center, Inc., the entity that will develop and manage the theater. The agreement stipulates that the lease can be extended for an additional 99 years, and the Port Authority can transfer the land to performing arts center for one dollar if it chooses. Once the deal is inked, the Perelman Center will fork over $48 million—money it's receiving from the Lower Manhattan Development Corporation (LMDC)—to the Port Authority, which is using the funds to cover the cost of below-ground site work for the building. The site work will be done by the end of this year. The amount is a compromise between the LMDC and the Port Authority: Last year, the agencies couldn't agree on how much the former owed the latter for the work, an impasse that stalled the project's build-out. When it's complete, though, the building should be a stunner. Clad in the same creamy marble as SOM's Beinecke Rare Book & Manuscript Library at Yale, in renderings the cubed exterior is subtle but stylish, with enough heft to hold its own against the skyscrapers that surround it. REX was picked to design the project back in November 2015, and designs were revealed in a public ceremony less than a year later. Above-ground construction on the site, at the northwest corner of Fulton and Greenwich streets, will begin next year. The Architect's Newspaper (AN) reached out to REX for comment but did not immediately hear back. 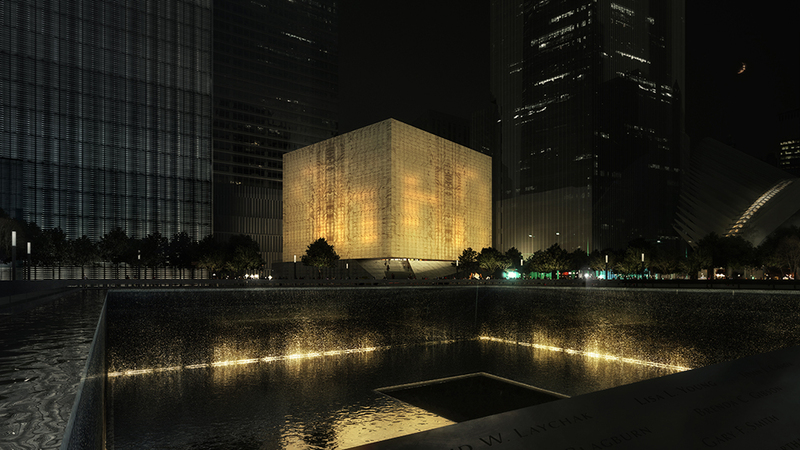 2017 Best of Design Award for Unbuilt – Commercial: The Ronald O. Perelman Center at the World Trade Center Architect: REX Location: New York On one of the most significant sites in New York City, the Ronald O. Perelman Center at the World Trade Center will feature works of theater, dance, music, film, and opera. It is a pure form, wrapped in translucent, veined marble, laminated within insulated glass. The performing arts center includes three auditoria, which can combine to form seven additional configurations and a rehearsal room—all can adopt manifold stage-audience configurations with flexible patron flow—as well as offices and recreational spaces. The keystone and final piece of the World Trade Center master plan, the Perelman Center embraces creation and memory with respectful individuality. “A respectful addition to a complicated site, with an especially elegant, thin marble skin that is sure to transform the surrounding public space, day and night.” —Irene Sunwoo, Director of Exhibitions, GSAPP (juror) Architect of Record: Davis Brody Bond Theater Consultant: Charcoalblue Facade Consultant: Front Structural Engineers: Magnusson Klemencic Associates with Silman Acoustics + Vibration: Threshold Acoustics with Wilson Ihrig Honorable Mention Project: Lima Art Museum (MALI) Architect: Young Projects Location: Lima, Peru This proposal for the New Contemporary Art Wing at Lima Art Museum inverts two mirrored ellipses, creating a structural and conceptual grid. The geometric orientation of the ellipse, its curve orbiting two focal points, contrasts the rectilinear logic of the existing historic Palacio de la Exposición. Located in the Tribeca East Historic District, 14 White Street is a 30,000-square-foot mixed-use building clad in a distinctive patinated copper alloy panel. This contemporary metal envelope establishes a dialogue with the neighboring cast-iron manufacturing buildings through subtle references to proportions, cadence, and texture. Each panel is acid-etched with the very line work used during fabrication. The panel’s angles and resultant etching vary from window to window, capitalizing on the ease of customization in automated digital fabrication and allowing for smaller apertures for private spaces like bedrooms and bathrooms, and larger for public areas like living and dining rooms. It will be an ultra-efficient build- ing with high-performance windows and a hyper-insulated rainscreen envelope beneath its metal-clad exterior. "In a city with an increasing number of one-off icons, it's refreshing to see a building that unapologetically situates its inventiveness at the scale of the detail, resulting in an elegant, cohesive whole.” —Eric Bunge, Principal, nArchitects (juror) Honorable Mention Project: Long Island City Oyster Architect: Carlos Arnaiz Architects (CAZA) Location: New York LIC Oyster addresses the imbalance of a high-rise residential boom amidst the steady retreat of manufacturing in NYC, reinterpreting the local aesthetic of brick arches as a shell-shaped development on the Queens Waterfront. LIC Oyster’s built footprint occupies 55 percent of the total site area, leaving a public park measuring over 2.5 acres. Honorable Mention Project: Necklace Residence Architect: REX Location: Long Island, New York This residence is organized into a necklace of five homes and three shared pavilions for events, entertainment, and children’s play. The family compound’s exterior is wrapped in mirror glass to make it disappear into the site upon approach, reducing the perception of its large mass. A circular walkway overlooking the courtyard garden connects all the residence’s gems. REX has bestowed a shiny new skin on a late Brutalist office building that was, until recently, one of the ugliest buildings in Manhattan. Up until the renovation, the building was known as the elephant's foot, in dubious honor of a horrific 1980s renovation that left the elegant concrete structure clad in brown metal panels and beige paint. Now called 5 Manhattan West, the building has undergone yet another makeover, spearheaded by REX, to update its facade with the latest in form-fitting fenestration. The Brooklyn-based firm ultimately devised a pleated glass facade that ripples down the building like a stretched ziggurat to flood the large, open interiors with light. These pleats are composed of panels angling out toward each other from the floor and ceiling, a design driven by the need to mitigate the structure’s slope, which limited the leasable space along the interior perimeter. But the unique form is more than just window dressing. According to Joshua Prince-Ramus, REX's founding principal, “What’s interesting about the geometry is that the sun doesn’t hit the lower piece of glass, so we can have a building that is transparent and simultaneously energy efficient." Prince-Ramus praised REX's client, Brookfield, for its holistic approach to sustainability that centered reuse—not just LEED-level performance. "In our lifetimes, adaptive reuse is going to be the stuff from which we make 'capital A Architecture,'" he said. The pleating also complied with ADA standards for head strike, allowing for uninterrupted exterior views while maximizing tenants' floorspace, and allowed the designers to rigorously test the concrete from the 1960s, which was cast using different standards from today. The structural maneuvering honestly exposed concrete from Davis Brody's (now Davis Brody Bond) original design, a move that was especially evident on the east-west breezeway. The renovation was done with tenants in place, on a feverish nights-and-weekends schedule. Although some floors have yet to welcome new tenants like J.P. Morgan Chase and Amazon, 5 Manhattan West's common spaces and outdoor areas by James Corner Field Operations are largely complete. The squat, 1.7-million-square-foot structure features ground level retail, a two-story elevated breezeway on the southern side, and a full interior renovation, with open floor plates ranging from 86,000 to 124,000 square feet (no, that's not a typo). With ceiling heights from 15 to 17.5 feet, the super-sized office spaces allow the old-new building to compete with Hudson Yards' office spaces, which feature large, and largely column-free, interiors. Adamson served as executive architect for the $350 million project. The 5 Manhattan West re-clad slots the office building squarely into Brookfield Office Properties’ Manhattan West development. Bounded by Ninth Avenue to Tenth Avenue and 31st Street to 33rd Street, Manhattan West encompasses nearly six million square feet across six buildings. Construction on the REX-designed performing arts center at Ground Zero could be delayed if the federal government decides to revoke millions in funding. After 9/11, the U.S. Department of Housing and Urban Development (HUD) gave nearly $3 billion in funds to the Lower Manhattan Development Corporation (LMDC), the public-benefit program in charge of the area's regeneration. 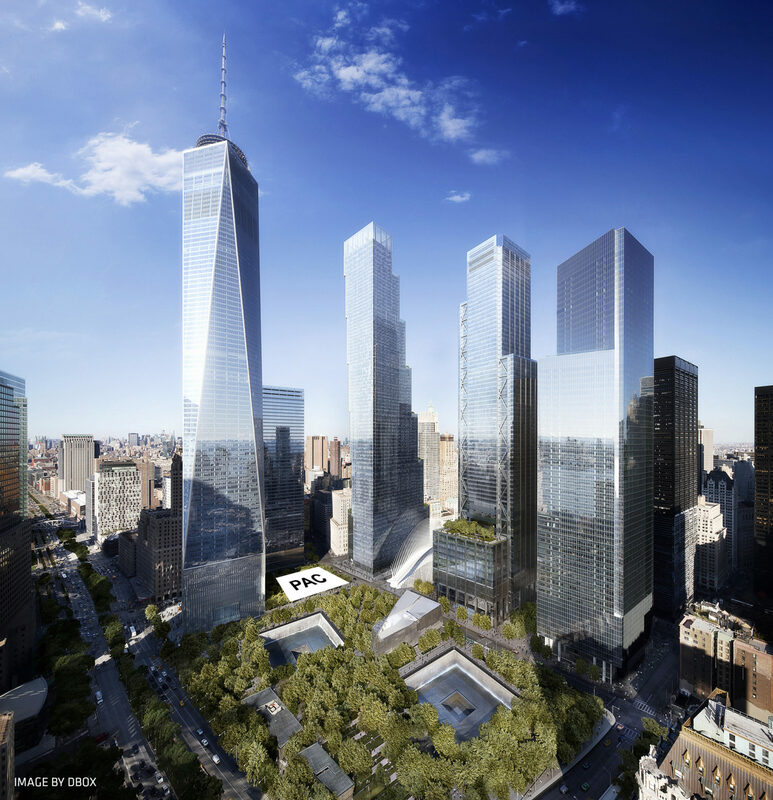 The LMDC has $150 million of that grant money left to spend, and the group planned to use around $100 million of those funds on the luminous Ronald O. Perelman Performing Arts Center at the World Trade Center (the Perelman Center, for short). That plan, though, was called into question at a recent LMDC board meeting. REX's project would be built on Port Authority land, but the agency says the LMDC owes it money for the work it did to prepare below-grade land for construction. Both parties agree on the existence of the debt, but not the amount: the Port Authority says it's owed $67 million, while the LMDC claims it owes only $45 million. These issues could leave Perelman Center construction at an impasse, but Crain's reports the two parties are working towards a compromise by the end of June. In HUD's eyes, the LMDC may have done too good a job bringing the World Trade Center area back to life. The neighborhood—with new and new-ish buildings by Calatrava, SOM, Fumihiko Maki, and (soon) BIG—has bounded back in the 16 years since the 9/11 attacks. Given its remarkable resurgence, state and local officials say the LMDC completed its fundamental task, so HUD may want its money back. Though restaurants are extending the neighborhood activity past 5 o'clock, the Perelman Center boosters say the area needs a performing arts center to fully cultivate a 24/7 neighborhood. In addition to shows, the first floor would be home to a cafe and restaurant with extended hours that would, its architect said, anchor the neighborhood by drawing people in even in the absence of scheduled performances. Today, REX’s design for the Ronald O. Perelman Performing Arts Center at the World Trade Center was revealed before an eager audience of architects, press, developers, and New York City patrons of the arts. “Downtown is back as a premier place for business," said Larry Silverstein, co-founder of Silverstein Properties, a major stakeholder in the World Trade Center site. "There is 10 million square feet of office space replacing what was destroyed on 9/11, and there are 25,000 workers in that space. The neighborhood has become a model of what is best and most exciting about New York. Daniel Liebskind's master plan for the area balanced commemorative function with the need to create a vibrant neighborhood. The performing arts center is an integral part of that and will bring a new dynamic to downtown." Maggie Boepple, president and director of the Perelman Center, noted that the group met with over 200 people—artists, neighbors, and critics—to determine what type of performing space the city most wanted. The resulting program translates the need for flexibility into mutable performance spaces that can be endlessly configured, explained Joshua Prince-Ramus, founding principal of REX. His team created a translucent marble box with a creamy amber pattern straight from a grandmother’s snakeskin purse but with all the requisite gravitas for a building on hallowed ground. “The light comes out like a beacon,” the eponymous Perelman gushed. "[The center] is a simple, pure form that creates a mystery box, defying [visitors'] expectations," Prince-Ramus said. At the intersection of Greenwich and Fulton, and perpendicular to Calatrava's PATH station, the three-story building is "an exciting pop" that dialogues with the entry to the 9/11 Memorial and Museum and St. Nicholas Orthodox Church, he noted. The facade is made of the same Vermont marble used for the Jefferson Memorial and the recently-refurbished Beinecke Rare Book & Manuscript Library, but the Perelman Center's stone will be sliced thinly and laminated between two layers of glass to improve the structure's performance. Like a magic show, architects from REX's team lined up to pull the model apart, layer by layer, as Prince-Ramus detailed its functions. Visitors enter the coffered main lobby (level one) through a staircase that spills from a steep cut at the top of a 21-foot plinth. The top floor, the Play Level, is comprised of four main auditoria—with 499, 250, and 99-person capacities, plus a smaller flex space—whose acoustic guillotine walls have “an endless number of permutations [for the artistic director to create] that we can’t even predict, and that’s incredibly exciting.” The renderings and diagrams in the gallery above depict some possible arrangements and circulations. The Performer Level, level two, is the building's support area, with practice spaces, dressing rooms, costume shop, and green rooms for performers. In most theaters, these spaces receive scant light; in REX's design, the translucent marble facade allows natural light in. 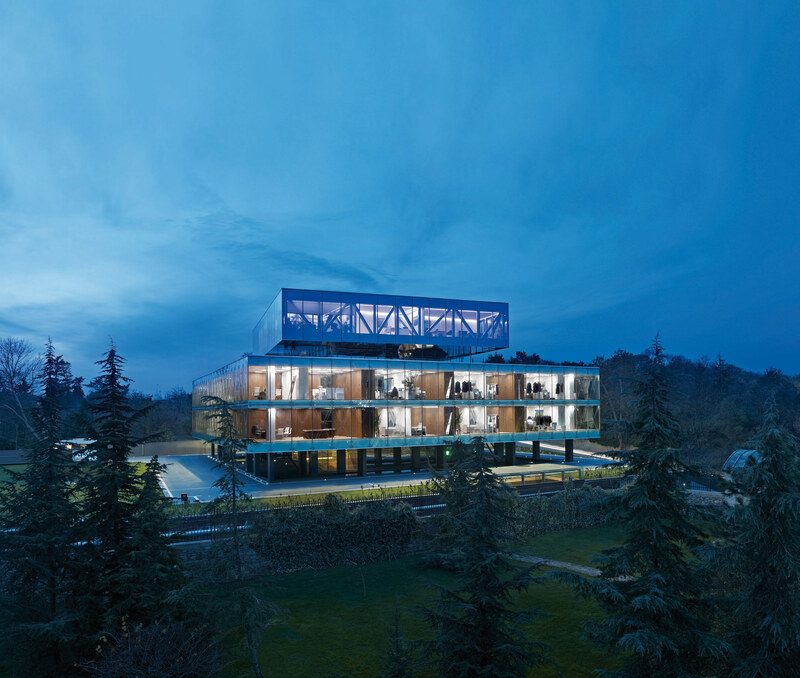 AN spoke with Sebastian Hofmeister and Vaidas Vaiciulis, two REX architects on the project. The layered model took three or four weeks to make, "and at the end, even Joshua was gluing a few pieces on," they said. This video by David Langford (link here) takes viewers through the site, and inside the model, while the section GIF below shows visitor flow through the building: Brooklyn-based REX is collaborating with Threshold Acoustics consultants from Chicago and theater designer Andy Hales of Charcoalblue (the same firm that collaborated with Marvel Architects on the recently opened St. Ann’s Warehouse in DUMBO). The 90,000-square-foot building's design changed “remarkably little” between concept and execution, Boepple said, except to allow for additional security measures. Due in large part to a $75 million donation from its namesake board member, the Perelman Center has raised $175 million of its $250 million projected cost, with $99 million of the funds coming from HUD regeneration money dispensed through the Lower Manhattan Development Corporation (LMDC). The center is expected to open in 2020. For more images and information, visit theperelman.org. Billionaire businessman Ronald O. Perelman announced yesterday that he is donating $75 million to the Performing Arts Center at the World Trade Center. The performing arts center featured prominently into Daniel Libeskind's 2003 master plan for the site. The center, a midsize theater backers tout as a forum for interdisciplinary work, stalled as officials clashed over the site's redevelopment: Frank Gehry was hired to design the site, but his plan was ultimately rejected in favor of a design by Brooklyn-based REX. It's one of the last unfinished pieces on-site. Perelman, the former chairman of Carnegie Hall, was impressed by REX's renderings (which are not yet public) and with the technological capabilities of the theaters. He got involved in the performing arts center began ten years ago, when then-mayor Michael Bloomberg became the chairman of the National September 11 Memorial and Museum to restore institution and public support of the project. He solicited support from Perelman, who eagerly agreed to a $5 million donation, The New York Times reports. The center will be renamed in his honor. REX's $240 million design shows three flexible theater spaces that can seat 499 people, 299 people, and 100 people, respectively, or be combined into a larger space for 1,200. Chamber opera, dance, theater, and concerts can be held in the center; and performances can be disseminated to global audiences via a sophisticated streaming system. In addition to Perelman's contribution, the Lower Manhattan Development Corporation contributed $100 million in federal funds to the project. Brooklyn-based architecture firm REX, led by Marcus Prize winner Joshua Prince-Ramus, has announced plans for a new 450,000 square foot "premium" office complex for real estate company Tishman Speyer. The building—which AN first reported on last year—will be located on 2050 M Street in Washington D.C. and aims to "set the new standard of trophy office buildings" in the district's "golden triangle," a renowned business hub. The project will feel light given its surrounding buildings—which range from Beaux Arts, Neoclassicism to Art Deco and Brutalism—feature heavy masonry exteriors. 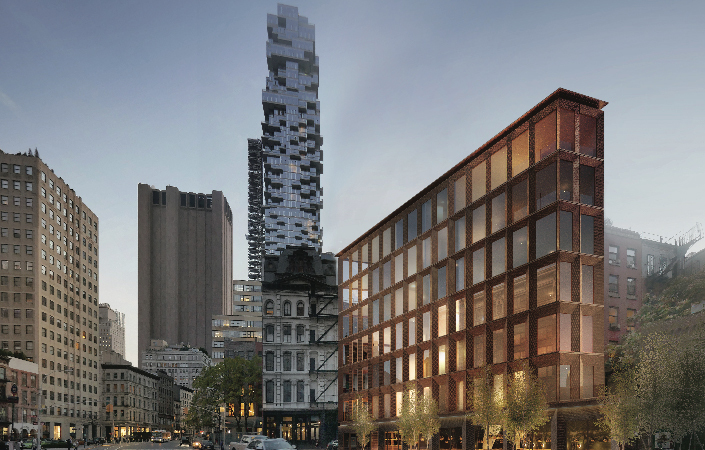 2050 M Street's distinction will be further accentuated by its lack of ornamentation. In this respect, REX's office building could be considered a contemporary take on Mies van der Rohe's high modernist style. While 2050 M Street avoids Mies's trademark use of steel structure, the principles of openness, proportionality, and legibility (in renderings, at least, the floors remain clearly visible) remain. As REX described in a press release, the project employs "hyper-transparent, floor-to-ceiling glass" that hide the view of "impending mullions." To achieve this, the glass will use "subtly-reflective pyrolytic" coating on the exterior. A relatively new advancement in glass technology, the process involves applying the coating while the glass is in a semi-molten state, allowing the chemical composition to form a bond and become part of the glass surface. The coating provides enhanced durability against scratches and other forms of degradation. In addition, a low-e coating will be applied within the glass’s insulating cavity to improve thermal performance by reducing solar heat gains. Both coatings will be applied to the curving panels that repeat 900 times along the building's facade to create a shimmering, kaleidoscopic effect, thus hiding the mullions. The panels' curvature also has a structural purpose: the "curve’s inherent rigidity in compression" means "only the top and bottom edges of the panels are supported from the floor slabs." Meanwhile, the "‘mullion-less’ vertical edges are flush-glazed for a minimalist aesthetic that improves sight lines, while gaining useable floor area." The lobby will also house site-specific art that has not yet been commissioned. The project has not broke ground but REX, in press release, stated that completion is due for 2019. Before BIG built its pyramid on New York’s west side, there was the concrete ziggurat at 450 West 33rd Street, designed by Davis Brody (now Davis Brody Bond) and completed in 1970. The 16-story office building lost whatever Brutalist charm it possessed when, in the 1980s, its precast concrete facade was painted beige and covered with brown metal panels and it gained the dubious honor of being one of the ugliest structures in New York. 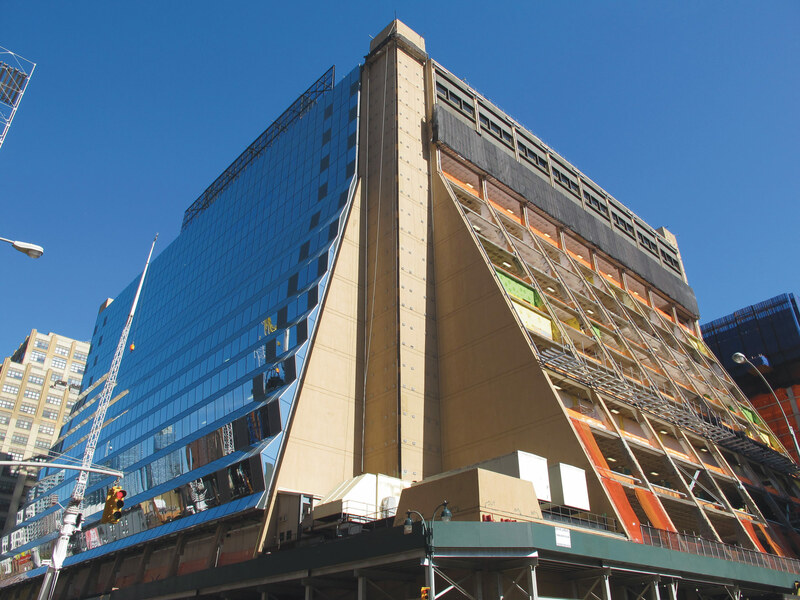 Now known as Five Manhattan West, the building is undergoing another makeover, spearheaded by REX, to update its facade with the latest in form-fitting fenestration. Every adaptive reuse project presents unique and unexpected challenges. To compensate for weakness or irregularity in the nearly 50-year-old concrete slabs, REX devised an unobtrusive steel substructure to support their new facade. Beyond re-cladding the building, the architects dramatically reconfigured its lobby and improved its core and mechanical systems. Impressively, this was all done while tenants continued to occupy the building. 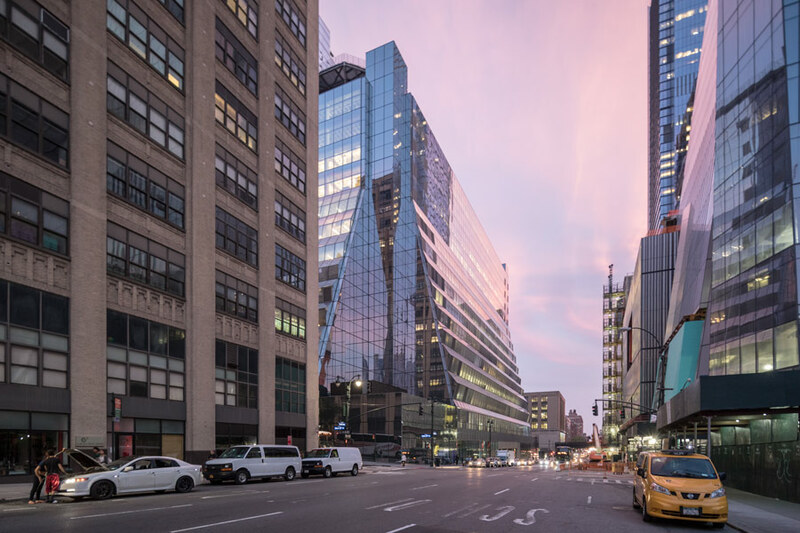 The glistening glass pyramid will anchor Brookfield’s adjacent Manhattan West development and its investment and ambition seem to be paying off. The massive floor slabs and floor-to-ceiling windows are attracting tech companies and other businesses looking for nontraditional office space. The anything-but-retro retrofit will be completed by the end of this year but the transformation is already profound. At street level, Five Manhattan West feels brighter and less imposing. Though its edges may have softened, the once-Brutalist building still cuts a distinct figure among the increasingly anonymous glass towers of Manhattan. Celebrating this achievement, Prince-Ramus’s work and notorious hyper-rationalist methodology will be on display at the University of Wisconsin, Milwaukee School of Architecture and Urban Planning until May 6, 2016. Here, visitors can find examples of notable works such as the Seattle Central Library, Vakko Fashion Center, AT&T Performing Arts Center, Dee and Charles Wyly Theatre, and 5 Manhattan West. Alongside these works will be details of REX’s process-oriented approach to design. This will include how a schematic rationale plays a key role in every project REX undertakes, hence forming purely functional-based buildings—something that is reflected in its aesthetic in unexpected ways.